Picture of the year award… Not! 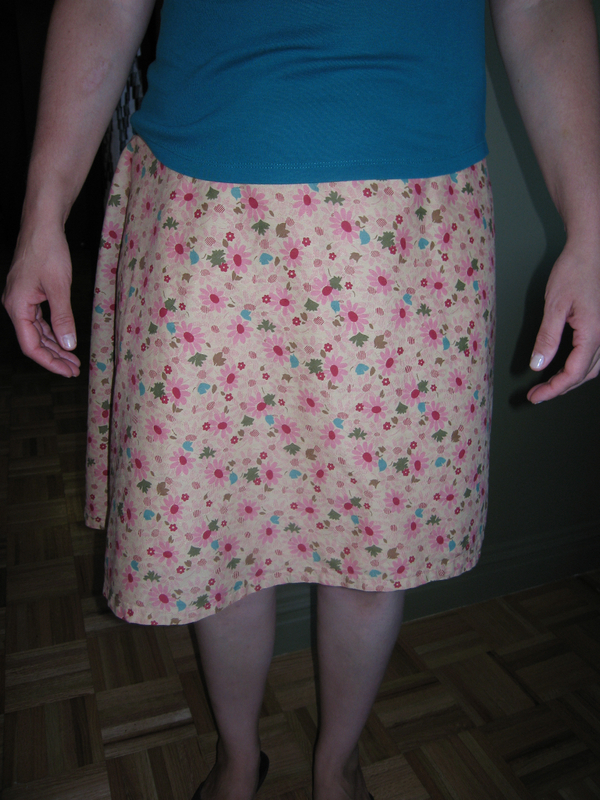 Here’s an action shot of the final wrap skirt. It’s pretty darn blurry as it was taken with a blackberry camera, as opposed to a real camera, but it will have to suffice for now. I am going to attempt to hand wash it and see how it fares. I wore it every day to and from the pool and for our daily walks on the beach. It fit all my needs for a beach cover up, meaning it covered my thigh area inconspicuously, and was sufficiently drapey. I did manage to get it wet a few times, but it didn’t seem to do any damage, hence my bravery to attempt handwashing. I am presently taking an underlining class on PatternReview with Sarah Veblen so I am working on the half scale garment assignments for that class. As I was away for four days and my full time job keeps getting in the way of my sewing, I haven’t really been able to work on them yet. Hopefully I will be able to work on the assignments this week. So I cut out the wrap skirt yesterday. Sandra Betzina recommends cutting chiffon in one layer, not on the fold. Unfortunately, when purchasing the fabric yesterday, I went against the advice of my psychic self and bought only 2.5 yds, when I should have bought three. Also, the cutter gave me the beginning yardage of the bolt which included some lovely adhesive stains. Any advice as to how to get rid of traces of adhesive from chiffon? Long story short, I was forced to cut the pattern on the fold and lacking a suitably large area to cut, was also forced to move the fabric and pattern around on the table in order to cut. BAD BAD BAD!!! Needless to say, there will most likely be a slightly to moderately wonky hem on this skirt. But as the fabric is drapey and it’s only a beach coverup, I don’t think it will be too noticeable or worrisome. Tonight it’s on to practicing rolled hems before finishing the skirt with rolled hems and hopefully I’ll have time to make and attach the waistband. Keep your fingers crossed for me! Here’s some pics of the fabric pre-cutting. It goes with my suit, pictured with said fabric. It’s not exactly what I was looking for print-wise, but I think it will work. Wish me luck! I am leaving for sunny Puerto Rico this week and finally bought my bathing suit. I have been putting it off due to the beached whale status of my body. Post baby, the workouts have been scarce (as already noted in my first blog post). I found one with enough shirring to hide most bodily sins of over-eating and under-exercizing and boy did I pay through the nose for this swimsuit. Dawn is making her own suits for her trip to Hawaii. Maybe sometime in the future, I will be confident enough in my sewing ability to attempt it myself. I also paid through the nose bought a matching skirt to wear on my way out to the beach from my hotel room so as not to embarrass myself until I get to the beach. But tonight, as I was doing yoga with a yoga dvd (the gym was closed, but I didn’t know it until I got there — If I worked out more, I might have known that already), I was thinking I could have made my own skirt to hide cover up my thighs instead of paying through the nose like I did. Have I said I paid through the nose yet? I have the perfect pattern for it. I have even already made it. It’s Indygo Junction’s “It’s a Wrap” skirt, IJ769. I have previously made it up in a 100% cotton which ended up being a little too stiff (see my review on Pattern Review). I was thinking of making it up in something with more drape this time and it obviously needs to be washable. I’ve already lined up my sister as babysitter tomorrow so I can hunt out some fabric at this cheapy fabric store in my hood, P & S Fabrics. I might change up the pattern a little because I am feeling like an expert already. LOL ! I was thinking of doing a rolled hem on my serger. Oh did I tell you I invested in a serger for Xmas? I bought the Brother 1034D. I’ve been taking a Serger 101 class on Pattern Review the last two weeks and digging it. I have to practice my new found skills, right? Anyhoo, let’s see if I have time for it. I have to make a spicy pumpkin pie tomorrow night not to mention making Jack a bunch of meals this week before I go. Oh and the parenting thing? It’s been going a little better lately. He’s such a sweet little boy. I admire his zest for life. I wish I had a little of that energy. And I just love that he loves to jump… just for the hell of it. What a wonderful thing to watch.